Irish College of English - Study English in Ireland. The Irish College of English was Established in 1992 and has an excellent reputation as a Quality Education Provider. A positive student experience is at the forefront of our school ethos. In 2014 we were honored by the Malahide Chamber of Commerce with the ‘Service Excellence Award’ for a clear demonstration of excellent and consistent customer service and in 2016 we were honored with the ‘Organisation of the Year’ Award. In 2015 we were the first English Language School in Ireland to be shortlisted for the Junior Course Study Travel Global Industry Star Award. In 2016 we were again shortlisted for this award as well as the English Language School Europe Award. We have Two Dublin Branches, one in Malahide and one in Portmarnock and a Residential Junior Summer Camp at Glenstal Abbey. Both our Dublin branches are within easy reach of Dublin City Centre and are ideal locations for language stays. Uniquely all our Host Family Accommodation is within Walking Distance of our Schools. We are delighted to announce our partnership with Glenstal Abbey, one of Ireland’s most prestigious residential boarding schools. Our International Residential Junior Summer Camp at Glenstal Abbey provides students with the opportunity to experience life on this historic campus. Glenstal Abbey offers students a unique mix of old world charm and state-of-the-art modern facilities. The campus includes a 19th century castle, which houses the dormitories, library and dining hall, and cutting edge modern additions for the classrooms and sports facilities. The Irish College of English is managed by Deirdre Rochford and Susan Mc Elhinney, whose approach is innovative and quality orientated. Other key staff members include: Lydia Ackermann our School Operations Manager, Loraine Grehan our School Ambassador, Vicki Kerins our Host Family Co-ordinator, Jane O’Hagan our Academic Manager, Ian Mc Elhinney our Social Activities Officer. Quality is our focus and we guarantee an Exceptional Learning Experience. At the Irish College of English our Teaching Staff are experienced professionals and all hold a minimum of a bachelor’s degree and a recognised TEFL qualification. Our premises are modern and we constantly strive to improve our client experience. 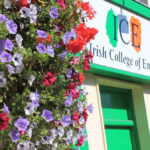 In addition the Irish College of English is recognised by the Department of Education and Science for the teaching of English as a Foreign Language. We are also members of the Quality Language Schools Promotion Body MEI and as such have learner protection in place.